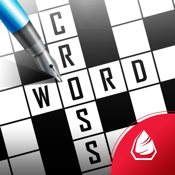 Crossword puzzles have long been a favorite for those wanting to blow off some steam, burn some time, or use their brain cells (or some combination of all three). 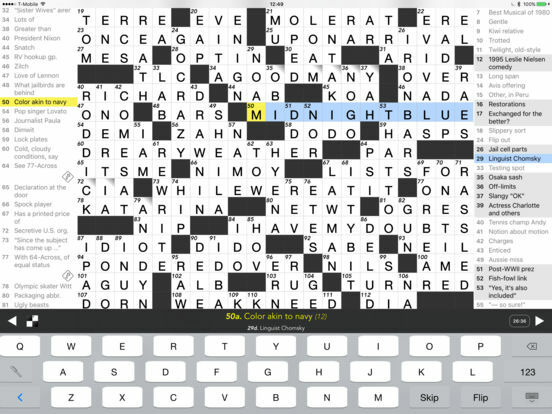 Once you step away from the newspaper, there are thousands of crossword apps you can download for the iPad. These have many benefits over paper puzzles. 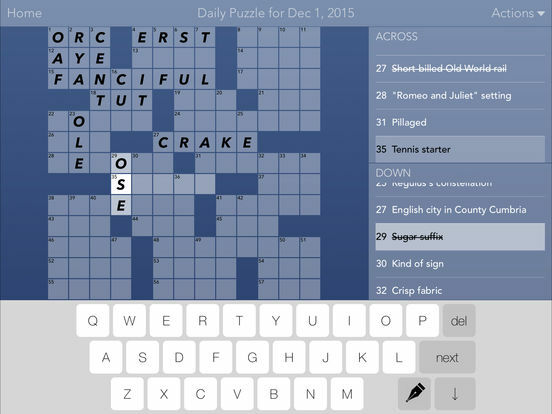 Try one or several of our suggestions for the best crossword apps for iPad. Crossword Puzzles! 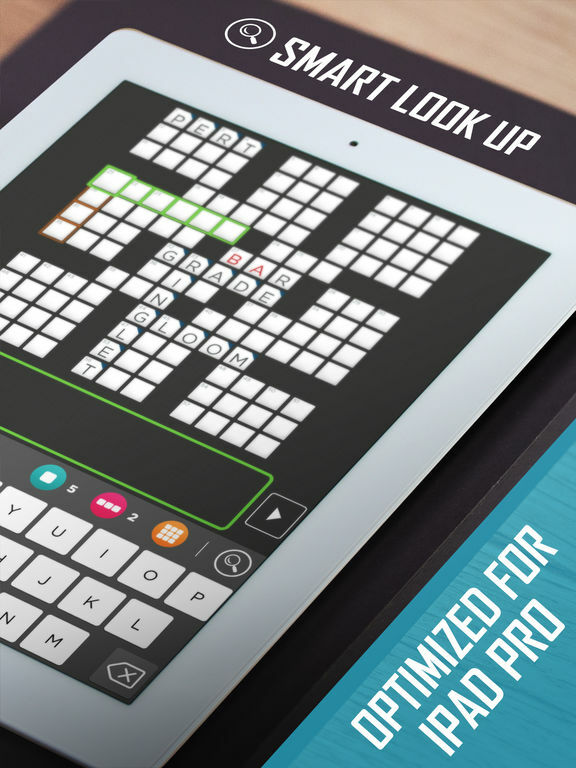 is a free app that allows you to play one free puzzle every day. The app takes you on amazing tours around the world with beautiful HD images. 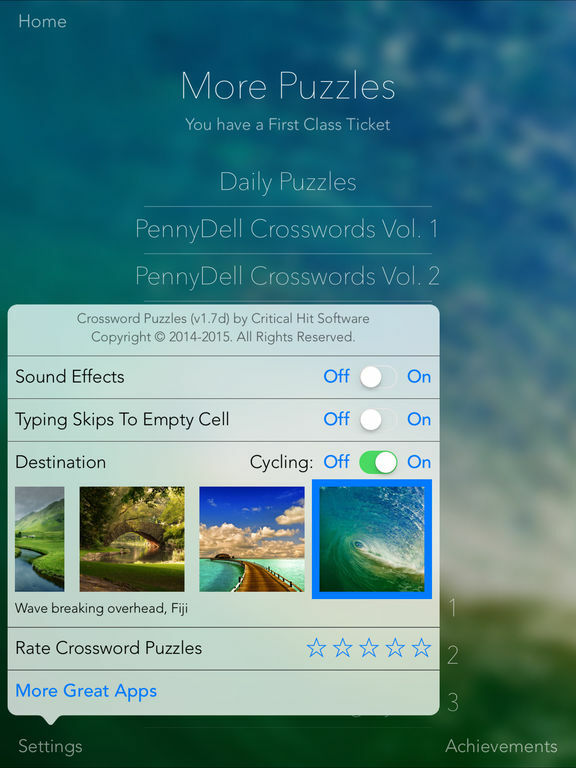 If you have a passion for crosswords and love traveling, then this is the app for you. There are thousands of puzzles available for all skill levels and if you get stuck you can request a hint. Most of the puzzles are available offline, so connectivity isn't a concern. The app supports both portrait and landscape orientations on iPad. When you are done a puzzle, check your work. 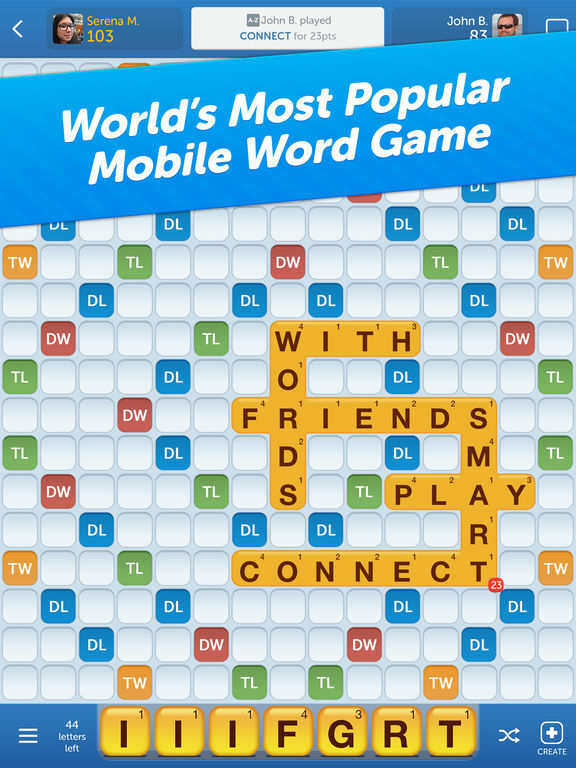 Words With Friends is one of the most popular mobile games ever. From playing on your app to playing through Facebook, most people have played this game at least once. Now, this app has improved on the game’s success with a few new features for players. 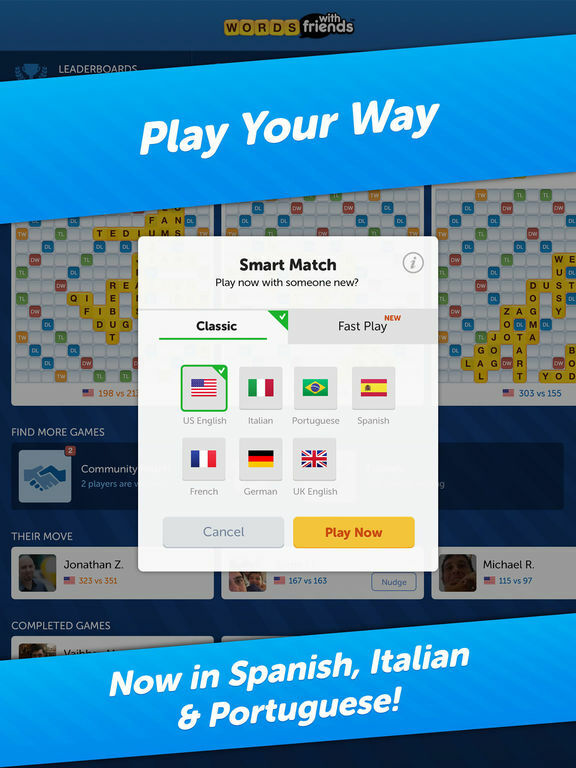 Invite friends, play against friends and family, search for opponents, play weekly challenges, view the word of the day to learn new words, chat with others, connect against others on your same skill level and much more. There are in-app purchases to remove ads and for Hindsight packs. 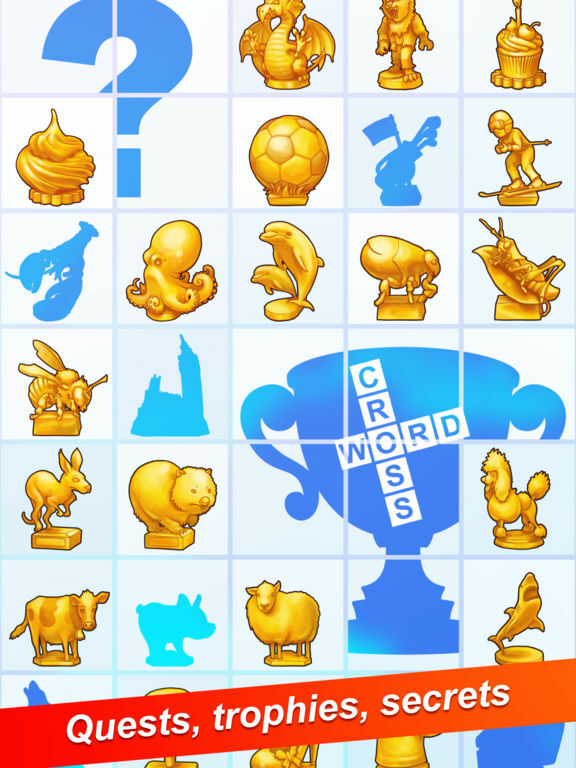 Crosswords is an award-winning app that allows you to play different puzzles from different newspapers. You'll get new puzzles every day! 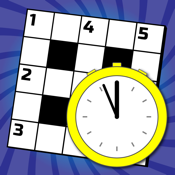 You can get hints, look at clues, and see how your crossword skills are improving with time. It's easy to see your recently played games, or sort by source, difficulty, or date. Want to compare your score against those of other players? Post your solve times online. You can choose to enter your answers in “pencil” or “ink” too! 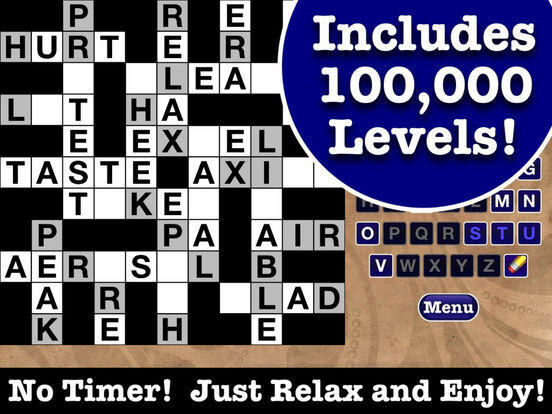 The upgraded version offers more features like more puzzle sources and the ability to download new puzzles in the background. The makers of Crossword: World's Biggest Cross Word set out to make the largest crossword puzzle, and they just might have succeeded. 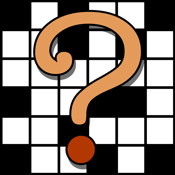 There are over 7,000 unique clues in this huge puzzle that is made up of over 350 crossword grids. There are many trophies to collect and quests to complete in this hand-crafted puzzle. Can you complete all of the individual puzzles? 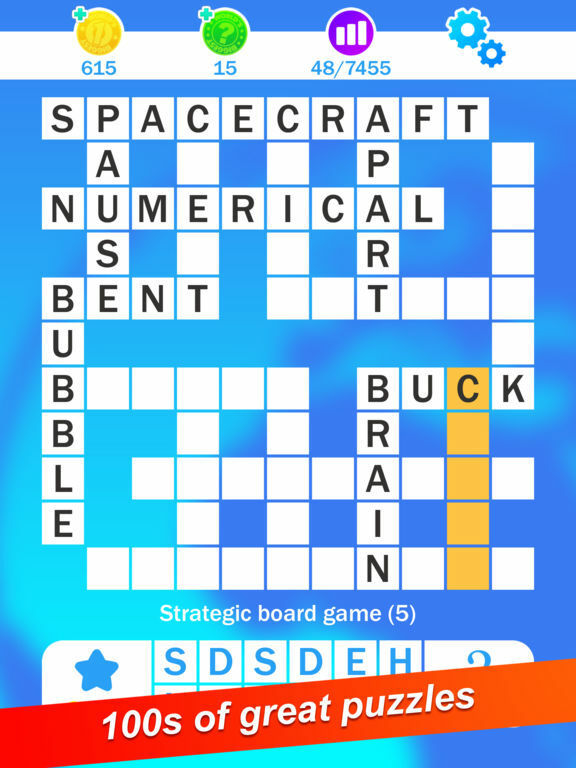 This app is free to download and play, but has optional in-app purchases that will help you unlock puzzles more quickly and to remove ads. 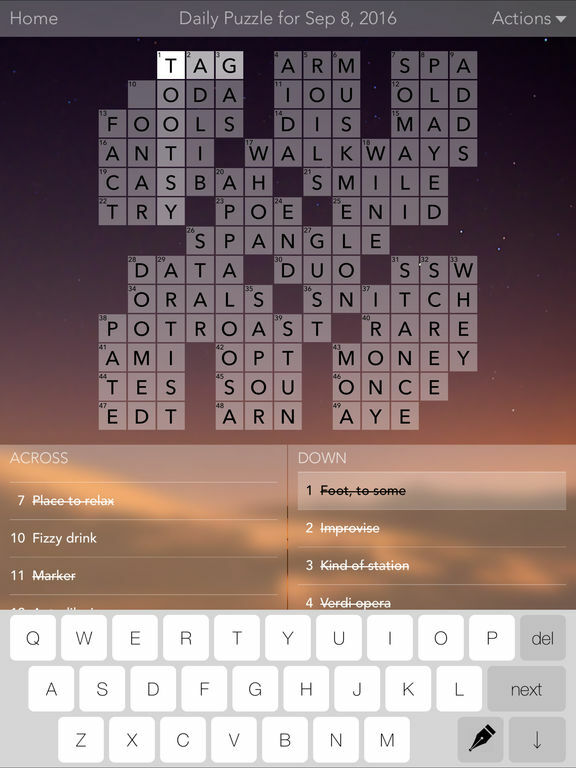 This crossword puzzle provides a clean, smooth experience that all crossword enthusiasts will enjoy. 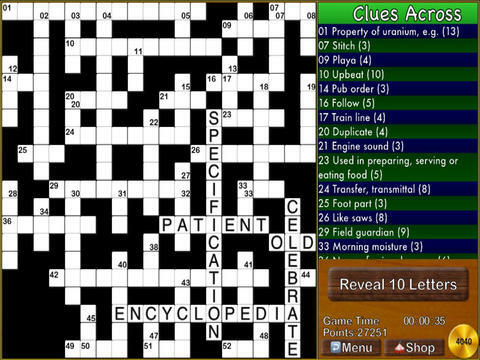 The clues are shown right on the crossword puzzle grid. This makes things much easier to view, instead of having to scroll back and forth between the puzzle and the clues. The app performs efficiently and the interface is easy to use. 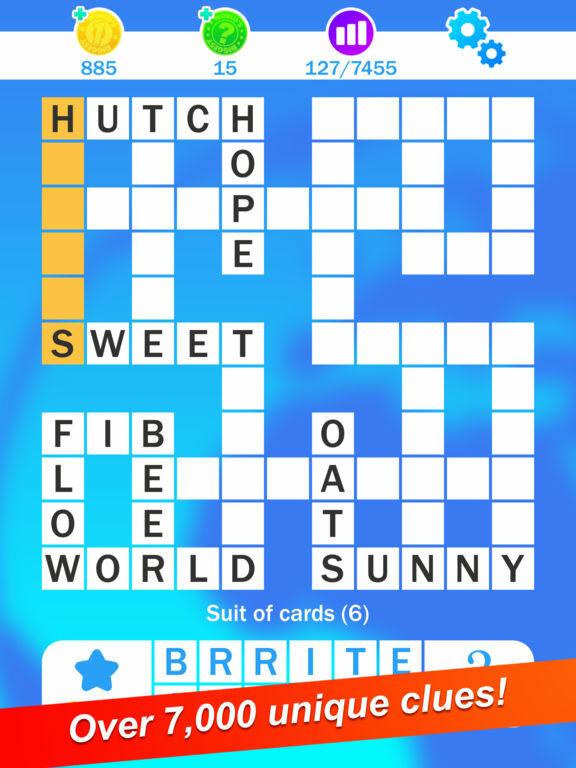 The wording is written in classic British English and the app is optimized for the latest iOS version. There are ads in this app. 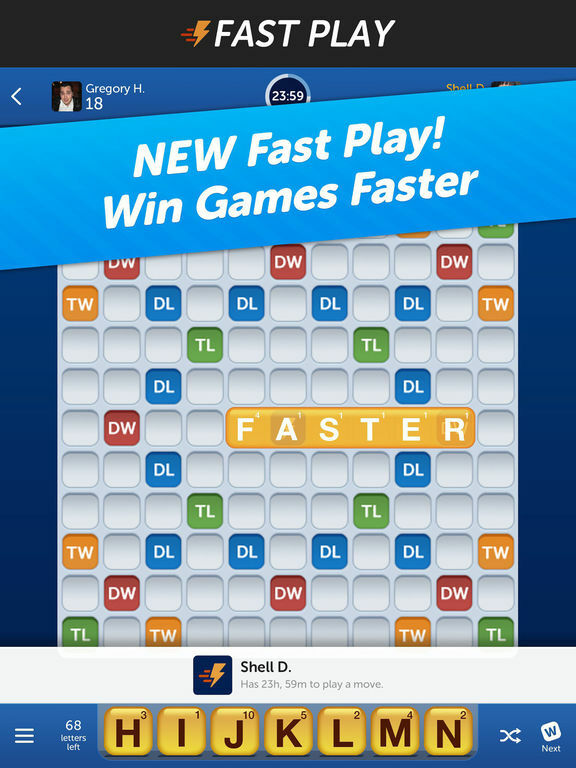 You will need to make an in-app purchase to remove the ads. 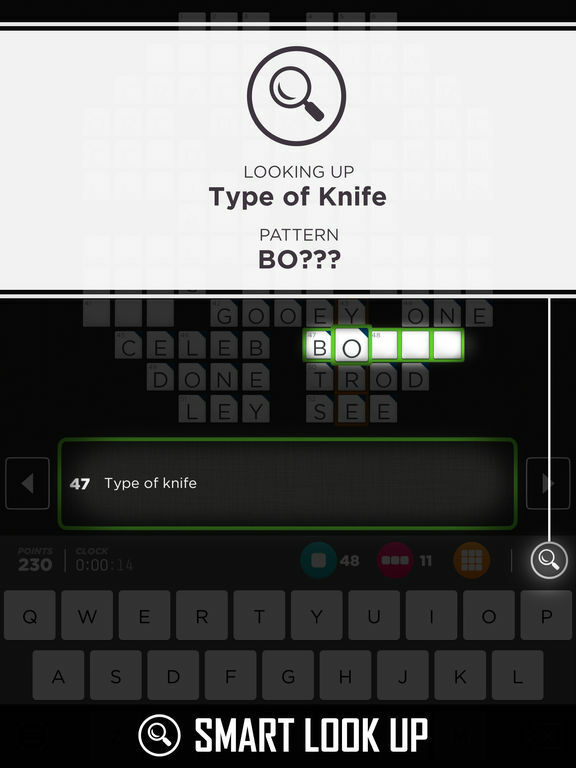 Crossword Jewels™ 100,000 Cryptogram Puzzles FREE! This is a nice little spin on the classic crossword puzzle. You must look for patterns among the letters to figure out the hidden words. 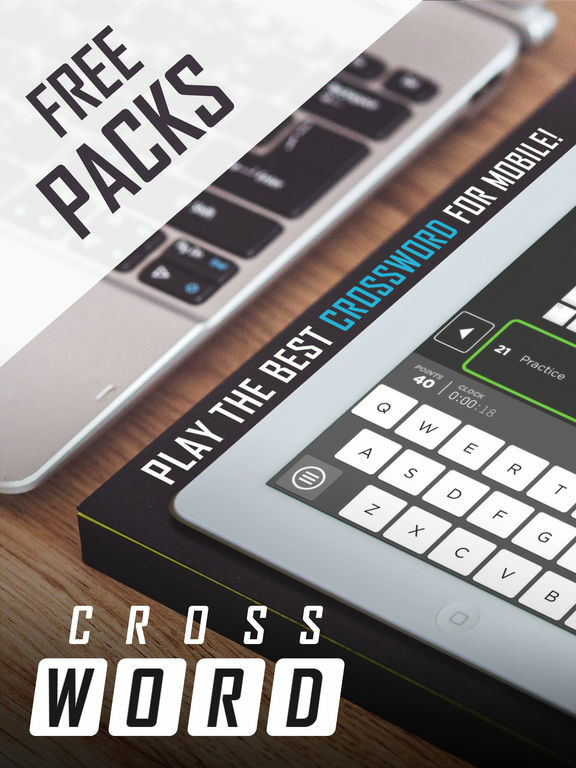 If you rather just play the crossword puzzle instead of the cryptogram, then the app does offer over 100,000 crosswords to enjoy. The letters are easy to read, touch controls are smooth, hint feature in case you get stuck, 7 levels of difficulty, progress within a puzzle can be saved for later, play right where you left off, disable the sounds if you want a quite experience or listen to your own music while you play. 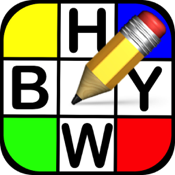 Little Crossword Puzzles is a collection of mini crossword puzzles that you can solve in under five minutes each. These are perfect for when you want to use your brain but don't have a lot of time to spare, or have a short attention span. 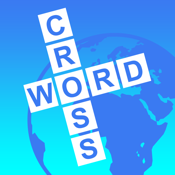 The puzzlers come in a variety of difficulty levels and come in three languages. 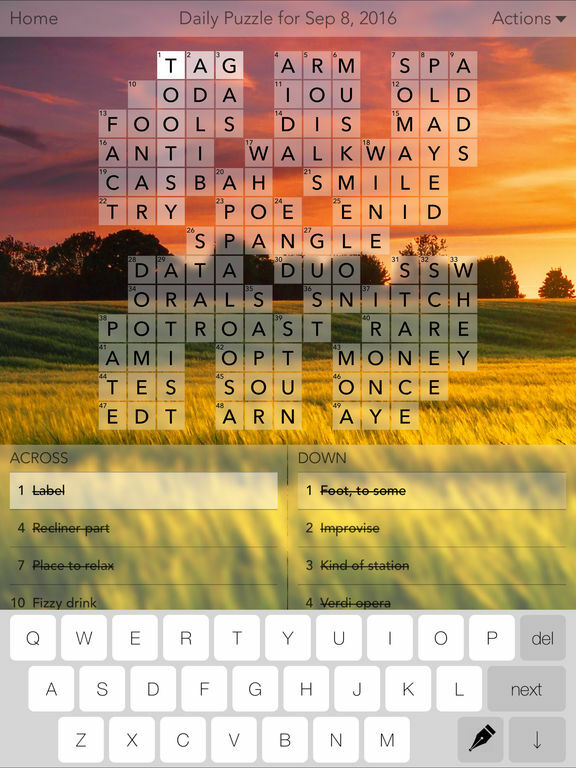 The greatest thing about this app is that you don't have to scroll to see the whole puzzle, or zoom in to read it. Want to skip a puzzle? Go ahead. You can earn coins, or buy them with in-app purchases. 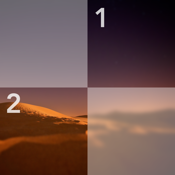 The app comes with five free puzzles; after that you will need to purchase them. 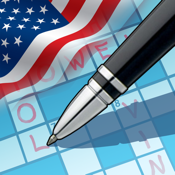 Crossword US is a free app that comes with 24 free puzzles you can pick up and play anywhere. 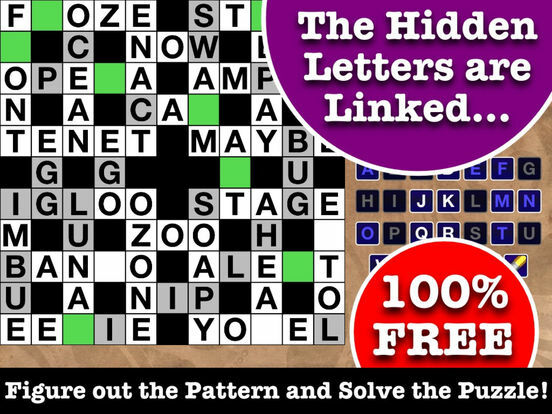 All the features are enabled within those free puzzles, and there are no ads. After you've solved all those puzzles, an in-app purchase can buy you the full set of over 480 puzzles, or you can purchase smaller packs. There's a resume button, you can check your answers, and the app works on iPad or iPhone. The puzzles are, of course, in U.S. style. 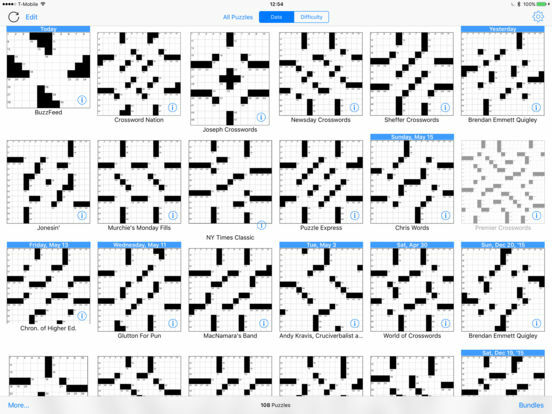 The price to download the remainder of the puzzles is quite reasonable given the number of puzzles you get. 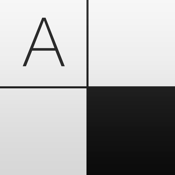 Lexeme is an anagram solver and crossword completer for people who are stuck on a puzzle. 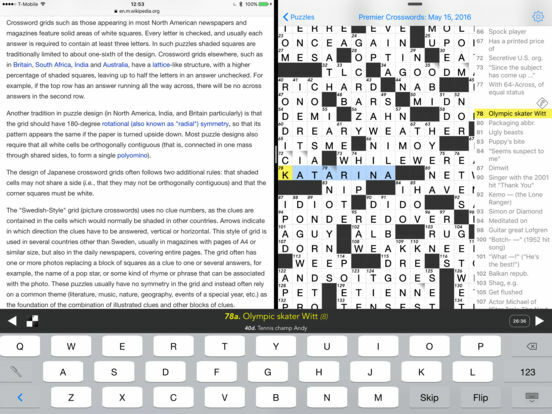 It uses constructions usually found in cryptic crosswords and simple syntax that works well with the iPad. 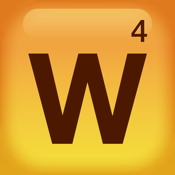 The app can look for words and phrases with missing letters, a pattern inside a pattern at any position, or anagrams of some or all letters. There is also a built-in thesaurus you can use. 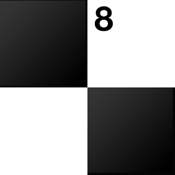 When looking to solve a fill-in-the-blank puzzle, use a question mark, space, or dot for each unknown letter. If you need to solve the phrase, use a comma to show a space. To solve an anagram, put brackets around a group of letters. 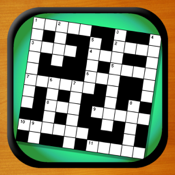 Crossword Puzzle Redstone is a fun crossword app with free included puzzles to start off with playing. The layout and graphics are well done and the app works on all your devices. 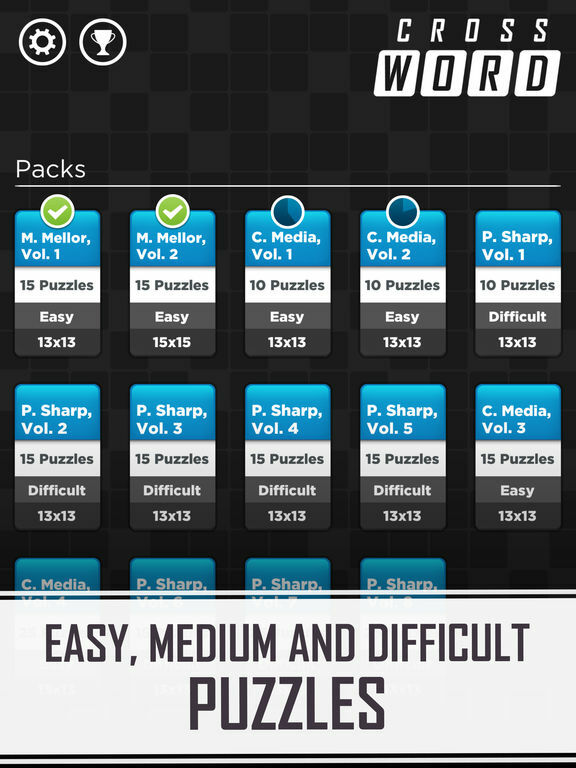 If you test the free puzzles and want more, new packs are added every month. If you like a good challenging crossword puzzle and you have a decent vocabulary, you will enjoy the ones here. Even better, the hints are free: you don't have to shell out your hard-earned cash to get unstuck. 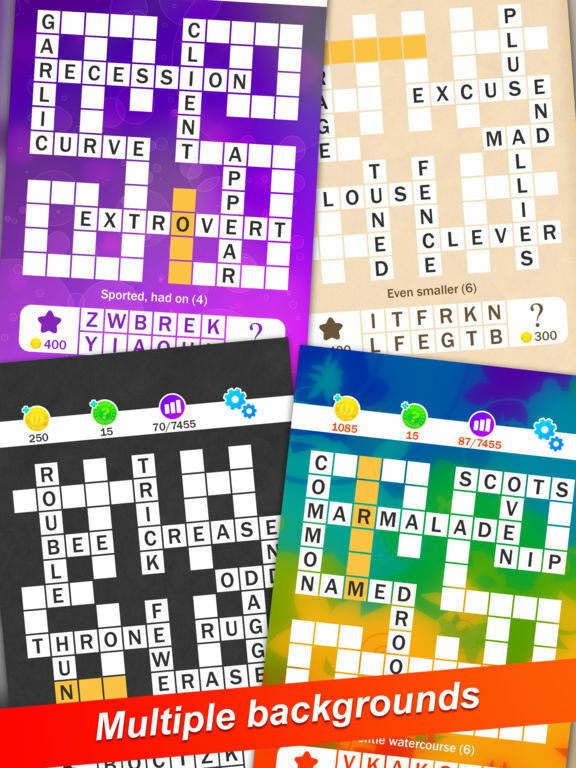 Multiplayer Crossword Puzzle HD FREE gives you challenging, entertaining, daily crossword puzzles for free. 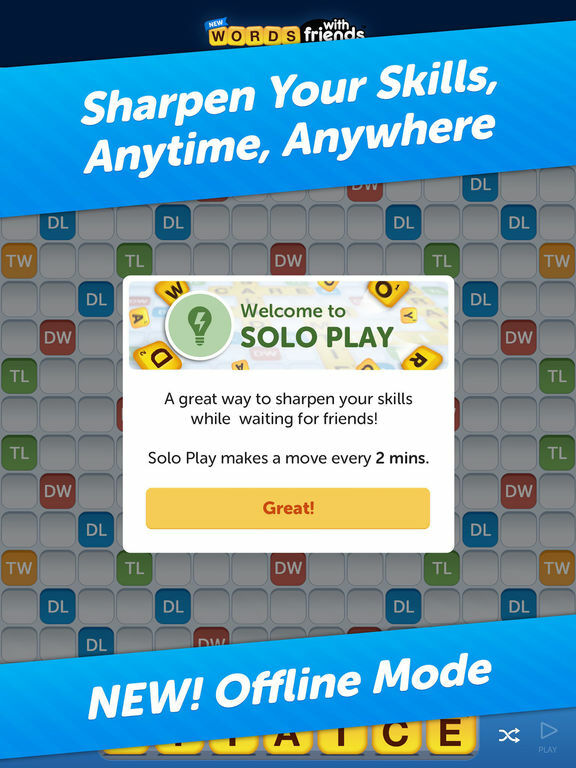 The app offers multi-player or solo gameplay. If you decide to compete against other players and get the most points, you'll win. The fonts used are easy to read and there are thousands of words and clues. 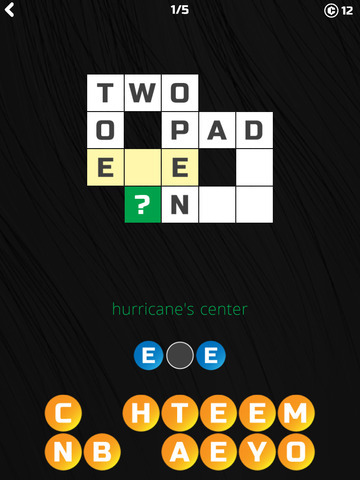 If you can't guess the answer there is an option called Anagram Hint to help you out. When you play the daily game, press the Play Now button. 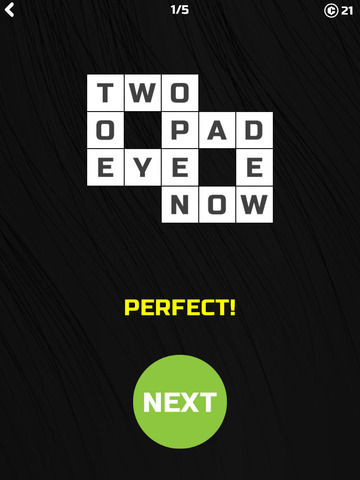 The timer will start and won't stop until you've completed the puzzle. Want some hints? You will have to spend some of your coins.